The K300 PS Junior comes with a standard adult power base, and the expandable seat pan allows for a custom fit no matter how fast a child grows. Features include flipback armrests, power seat elevator and power tilt functions with R-Net electronics.Integrated Uni-Track open the door for an infinite number of adjustments and add-on accessories. 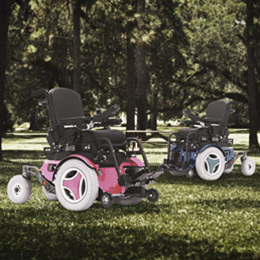 The K300 PS Junior Front Wheel Power Wheelchair is available in many colors. Call us for more information. Seat Widths 11" - 16"
Seat Depths 10" - 18"
Backrest Heights 16.5" - 22.5"